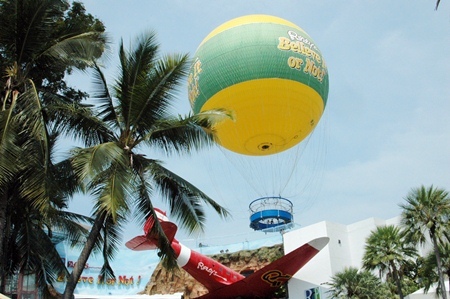 The Ripley’s Believe It or Not is creating a one a million opportunity for thai people to experience the glorious experience of flying. 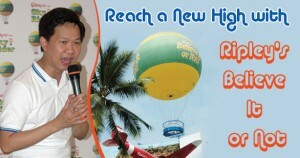 It’s called the “Ripley’s Sky Rider,” and is Thailand’s first tethered helium balloon. Balloon ride from the roof of Royal Garden Plaza open to the public since April 3 the 72-meter-wide balloon is equipped to carry 30 passengers to a height of 150 meters in the air. 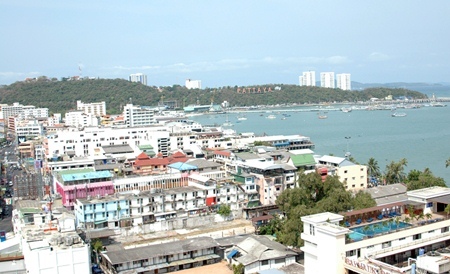 This ride is Ripley’s eighth tourist attraction to have opened in South Pattaya mall. It costed the company a staggering 80 million baht to install this attraction. The official opening of Sky Rider is in the month of May, till then the company is running a morning special, offering 10-minute rides for 300 baht each from 7-11 a.m. From 11 a.m. to 11 p.m. they are also offering a buy one-get one free discount ticket offer. ‘Sky Rider, uses the world’s largest tethered balloon model, ‘Aerophile AERO30NG’, currently it is also used in six other amusement parks around the world. Somporn Naksuetrong, deputy managing director for Royal Garden and Ripley’s said there is no restriction on age or height of passengers, although he warned wind conditions might limit how many people can fly simultaneously.